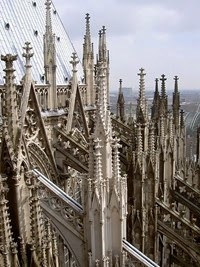 For more about 12th and 13th century cathedral design in France and Germany, please see: Gothic Cathedrals (1140-1500). Choir and apse of Cologne Cathedral. Regarded as the greatest expression of German Gothic architecture, Cologne Cathedral - along with Chartres Cathedral and Notre-Dame Cathedral in France - is one of Western Europe's most famous medieval sites of Christian art in all its majesty. Commissioned by Konrad von Hochstaden (1200-61), Archbishop of Cologne from 1238 to 1261, construction on the cathedral began in 1248, halted in 1473, and was only completed in 1880. As well as being the largest Gothic church in Northern Europe, it is also Germany's most popular monument of medieval art, receiving an average of 20,000 visitors a day. Located close to the River Rhine, the cathedral is famous for its architectural statues, steep gables, blind tracery and unifying series of spires, as well as its rare works of religious art, such as the sumptuous Shrine of the Three Kings (1191), the Gero Cross (960) - the oldest major carving of Christ crucified north of the Alps - and the Mailander Madonna (1290). Architecturally, the cathedral exemplifies the Rayonnant Gothic style although its design also includes some elements of extra-decorative Flamboyant Gothic architecture. In 1996, Cologne Cathedral was added to the UNESCO World Heritage List of protected sites. See also: German Gothic Art (1200-1450). The origins of Colgne Cathedral dated back to 1164, when the Archbishop of Cologne, Rainald of Dassel first obtained the relics of the Three Kings which the Holy Roman Emperor, Frederick Barbarossa, had stolen from the Basilica of Sant'Eustorgio in Milan. The relics possessed great religious significance and attracted believers from all over Christendom. As a result, church authorities determined that they required a fitting home - hence the decision nearly 90 years later to build a new cathedral in the fashionable Gothic style, modelled on the French cathedral of Amiens. It seems quite probable that the patron, Archbishop Konrad von Hochstaden, a supporter of Louis IX's anti-Swabian policies, wanted the building to reflect the formal elegance of the structures going up in Paris at the time, such as Sainte Chapelle (1241-48). The cornerstone was duly laid in August 1248, by Archbishop Konrad von Hochstaden and construction proceeded under the direction of architect Master Gerhard and later Master Michael. Although consecrated in 1322 work on the West facade halted in 1473 - during the highpoint of the celebrated Cologne School of painting - leaving the south tower complete up to belfry level. A large crane remained in situ scarring the Cologne skyline for 400 years, until work resumed in 1842. At this point modern building methods (including the use of iron roof girders) were incorporated into the construction plan, which was completed (more or less) in 1880. Its two huge spires - at roughly 157 metres (515 ft) tall, the second-tallest after Ulm Minster - give it the largest facade of any church in the world. The cathedral is 144.5 metres (474 ft) in length, 84 metres (275 ft) wide, and a window surface area of 10,000 square metres (108,000 sq ft) - roughly three times more stained glass art than Chartres. Rayonnant forms of Gothic art spread rapidly across the borders of France and were quickly adopted in the leading commercial cities. 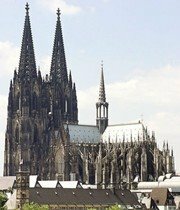 Cologne, like its contemporary Strasbourg, became one of the principal centres for the elaboration of Rayonnant Gothic, so much so that unlike the majority of similar German buildings, it is difficult to recognize any holdovers of the Germanic tradition. The plan of the cathedral is in the shape of a Latin Cross, and has two aisles on either side (a feature taken from Paris or Bourges), which support one of the highest Gothic vaults ever built, being almost as tall as that of Beauvais Cathedral, which collapsed in 1284. The general design of the building repeats that of the cathedral of Amiens, but not without variations. The presence of a deep westwork, which shortens the nave and creates a feeling of centrality, is perhaps a holdover of local traditions. The medieval choir has a very tall arcade, a narrow triforium gallery (with detailed tracery) lit by windows, while the clerestory windows are tall with some of the original stained glass in the lower sections. The vault is composed of a plain quadripartite arrangement. The 'modern' aspects of Cologne are its abandonment of the engaged column derived from Chartres to adopt instead a clustered arcade pier, a group of shafts that rise straight up without interruption to the springers of the vaults, and its luminous glazed triforium, similar to an elegant work of filigree thanks to the elimination of the small arches from the pendentives. Externally the outward and downward thrust of the vault is absorbed and channelled by flying buttresses in the French manner. Indeed its exterior is famous for its extravagant use of tracery, flying buttresses, stone sculpture, pinnacles and lofty porticos. A major treasure of the cathedral is its High Altar, installed in 1322. Made out of black marble, with a single slab 4.6 metres (15 ft) in length forming the top, its front and side surfaces are faced with white marble niches decorated with relief sculpture, illustrating religious scenes such as the Coronation of the Virgin, a popular Gothic motif. The most significant work of art at Cologne is the Shrine of the Three Kings (1191), a large gilt sarcophagus in the shape of a basilican church. Located behind the high altar, it was commissioned by Philip von Heinsberg, Archbishop of Cologne (1167-1191) and created by Nicholas of Verdun (c.11561232). A superb example of medieval goldsmithing and Romanesque sculpture, it is reputed to be the largest reliquary in the western world, and supposedly contains the remains of the Three Wise Men, whose relics were seized by Frederick Barbarossa during his conquest of Milan in 1164. Near the sacristy is the Gero Cross (96570) a large wood carving of the crucified Christ, originally gilded and painted. Created about 960 for Archbishop Gero (900-976), Archbishop of Cologne (969-976), this exquisite piece of Biblical art is believed to be the earliest-known large-scale crucifix north of the Alps. Located in the Sacrament Chapel, is the wooden Mailander Madonna (1290) an example of Marian Gothic sculpture depicting the Virgin Mary and the infant Jesus. The most controversial work of art in the cathedral is probably the huge 113-square-metre stained glass window created by the postmodernist German artist Gerhard Richter (b.1932). Consisting of 11,500 identically sized pieces of coloured glass, arranged at random by computer, it triggered a protest from the archbishop of the cathedral Cardinal Joachim Meisner (b.1933), who favoured a more appropriate figurative depiction of 20th-century Catholic martyrs. See also: Stained Glass: Materials & Methods.  For more about German Gothic architecture, see: Homepage.